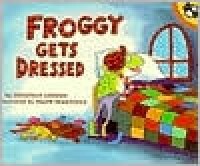 Froggy Gets Dressed by Jonathan London is such a fun read for young readers! This book provides a great deal of exposure to onomatopoeia and dialogue. This is great for beginning readers because they can read it to themselves and become familiar with these literary devices. The vivid illustrations are also engaging for readers of all ages as it draws you in and keeps you wanting to keep reading. I also think this book does a wonderful job of sequencing. Froggy undresses and redresses several times in the story. This opens up the door for a lesson on sequencing. I would use this in the classroom by asking students to write a story explaining how they get dressed for school in the morning. I would ask them to use adjectives to describe the color and style of the clothing they put on. I would also ask the students to include everything that they put on including socks and hair ties. In upper grades, I would ask students to include as much detail as which shoe they tie first, what do they button/zip, and more. At the end of the writing, I would encourage students to share their morning routine with their classmates so they can compare their routines with each other.